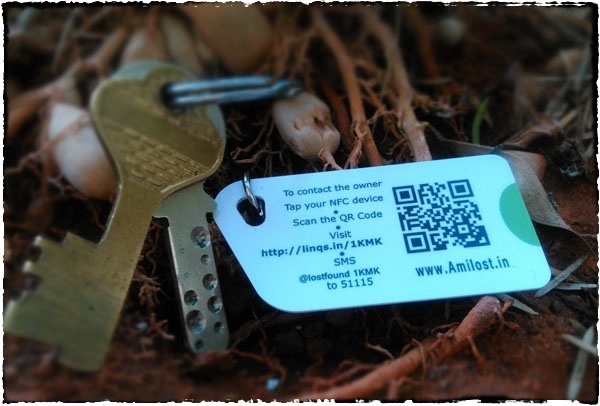 With AmILost Tags your lost things can get back to you! Add AmILost Tags to your valuable things Keys, Luggage, Phone, Laptop, Dog, Camera, Passport, Certificates, Purse, Sports equipment, Music instruments, Toys, Water bottle..anything that's dear to you.. Things get lost. We don't expect that but it happens often. Things also get found. The finder usually doesn't know who is the owner of the thing. AmILost Tags are like the old-fashioned name tags. But they are much smarter. 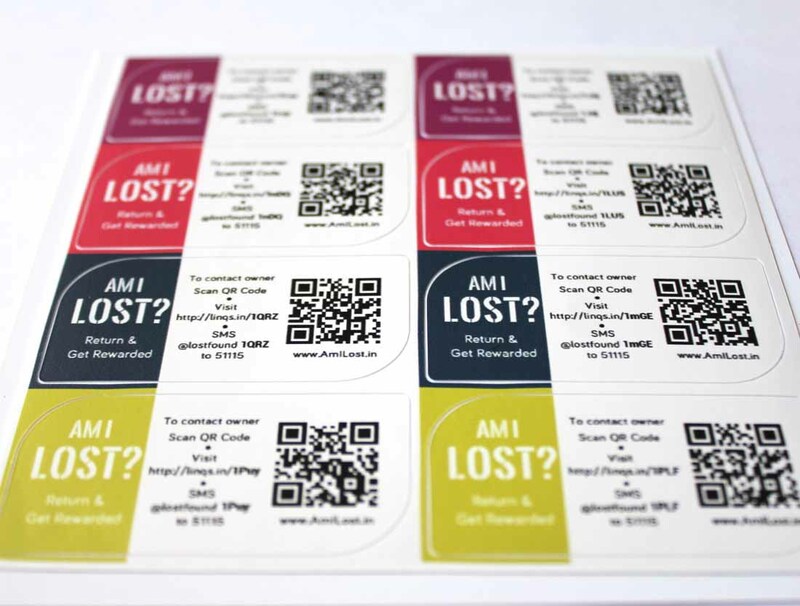 Using an AmILost Tag the finder can get your contact details & you can recover your lost valuable. The tags shares your contact details, only after they are lost, taking care of your privacy. 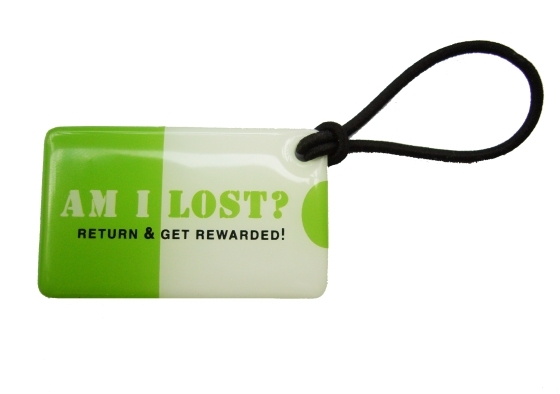 Operable from a simple SMS to a cool NFC chip, this is an elegant Lost & Found service that protects your valuables. 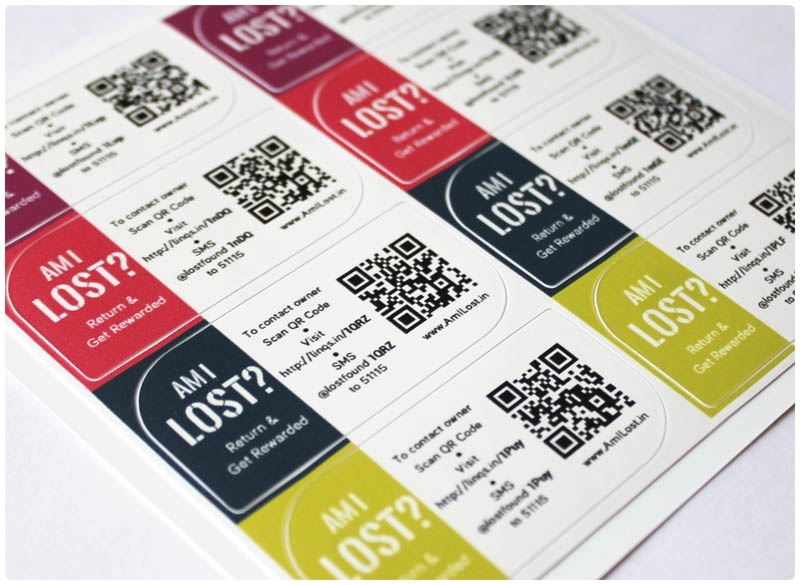 Give yourself some luck & peace of mind with the AmILost Tags! Tap/Scan the tag with your smartphone to add your contact details. Attach the tag to your valuable. 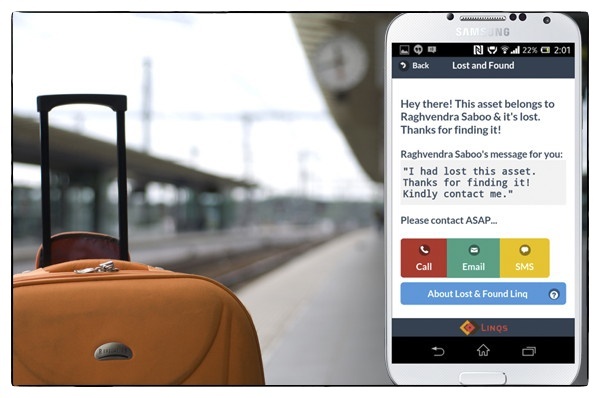 If your valuable gets lost, the finder can get your contact details by tapping the tag with a NFC smartphone or scanning the QR Code or entering the short URL in browser or simply sending a SMS to this service. Get a feel of how it works! Drag the phone on the key tag! Find the owner of this key! Create your own AmILost Tag! You need to have a LINQS account to be able to create a demo Lost and Found Linq. If you already have a account you need to be logged in. 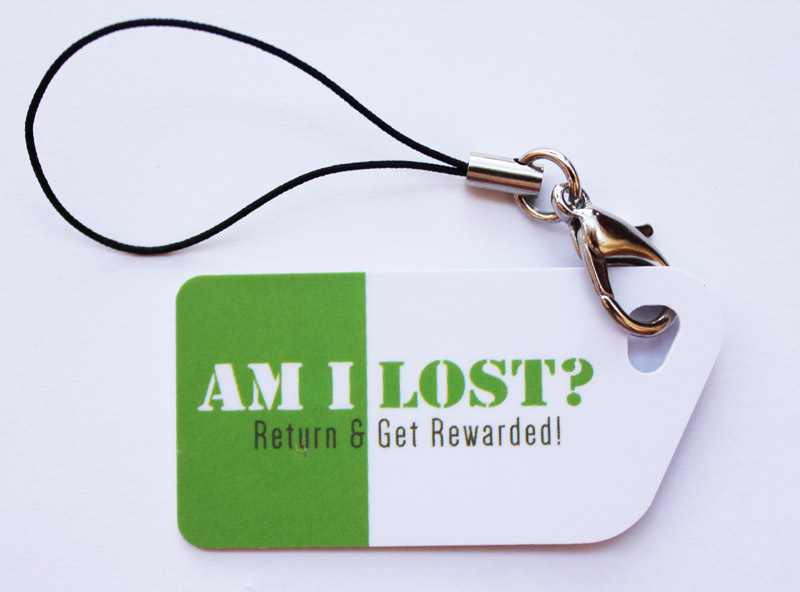 Given a choice, most people would directly contact the owner of a lost item rather than reporting to police/authorities or uploading details on a website. That is hassle free & makes them feel good. 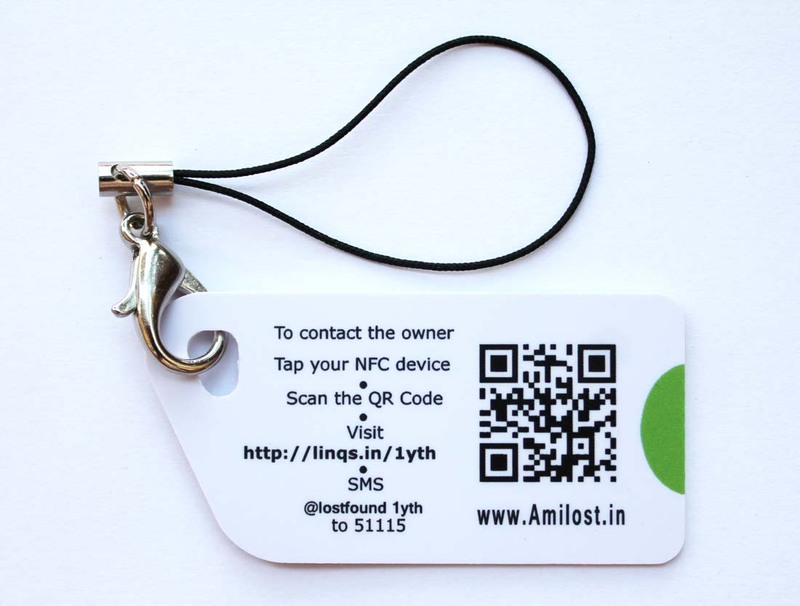 AmILost Tags make it simple for the finder of your lost item to contact you by showing your contact information on their phone. Just one touch to call, SMS or email. AmILost Tags is a solution for a very common problem. It uses just enough technology & leverages the inherent goodness in people. AmILost Tags store your contact details profile in the cloud. 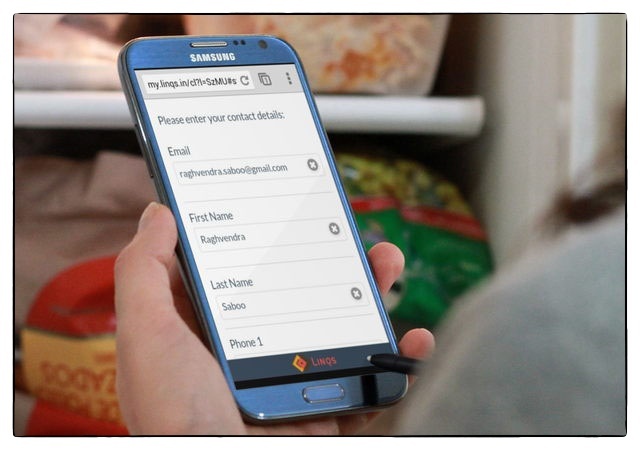 So you can modify your contact profile anytime & from anywhere. If you are on an international travel, you can change your phone number to the local one. You can also reuse AmILost Tags within your family & friend circle. Is this not more eco-friendly than paper tags? It's not wise to write you phone number or email id on your things. That could infringe your privacy & is also not aesthetic. But if lost things don't have any information about their owner, they don't get returned to their owners. AmILost Tags are smart. They don't reveal your contact details till the item is lost. But once your item is lost, you can activate the AmILost Tags from anywhere quite easily to show your conatct details to the finder. When AmILost Tag is inactive, someone who accesses the tag would see a game of Tic-Tac-Toe to help them pass the time! 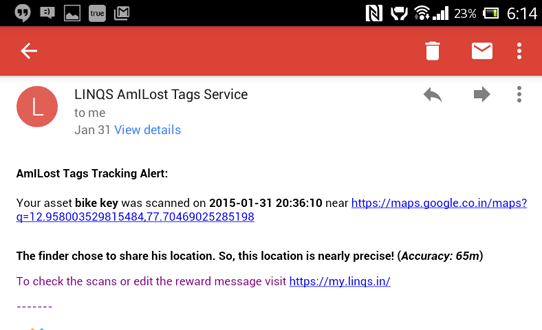 Whenever someone accesses your lost item's AmILost Tag, we send you a tracking email with Google Map link of the location & time when the tag was accessed. This would perhaps help you connect the dots.. 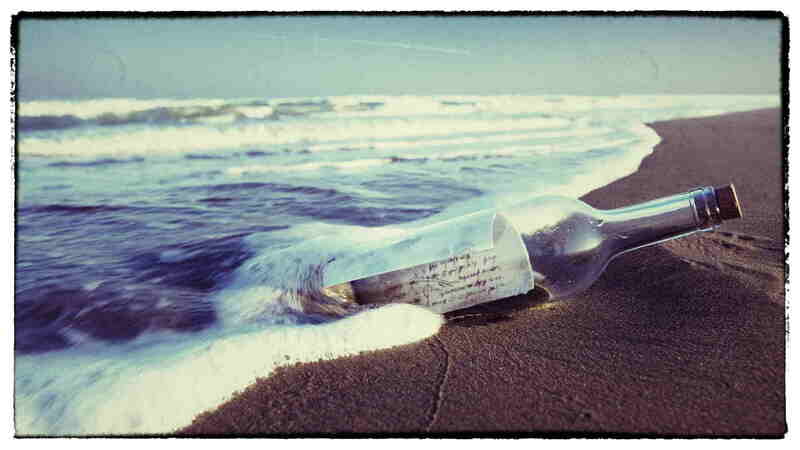 If something really precious to you gets lost, you are typically ready to reward the person who finds your item. With AmILost Tags you can not only declare the reward for the person who finds your item, you can also change the reward anytime. Good samaritans don't need monitory incentive to help you. However by being generous you increase the probability of finding your lost valuble. No app needed. 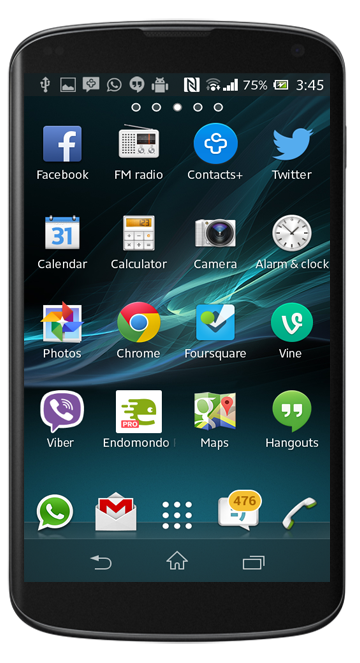 Works with feature phones too! With a feature phone or no internet connection simply send an SMS to AmILost service with the tag id. With internet connection on the phone visit the item's unique web link. With any QR Code reader app scan the tag's QR Code. With a NFC enabled phone simply touch the tag with the phone. The tag's owner can use any of these ways to crete/edit contact profile. You don't need an app for everything! A lost-item tracker shouldn't be more expensive that the item it's tracking. There are many Bluetooth based trackers available that are so expensive that you'd need AmILost Tags to protect them! AmILost Tags don't have a battery that you'd need to change periodically. AmILost Tags have been made to last long time. You can throw/drop them, leave them in rain & snow, without worrying. AmILost Tags won't drain your phone battery. They don't have to be paired with your phone. These are sleek, attractive & flexible tags with a smooth jelly feel. 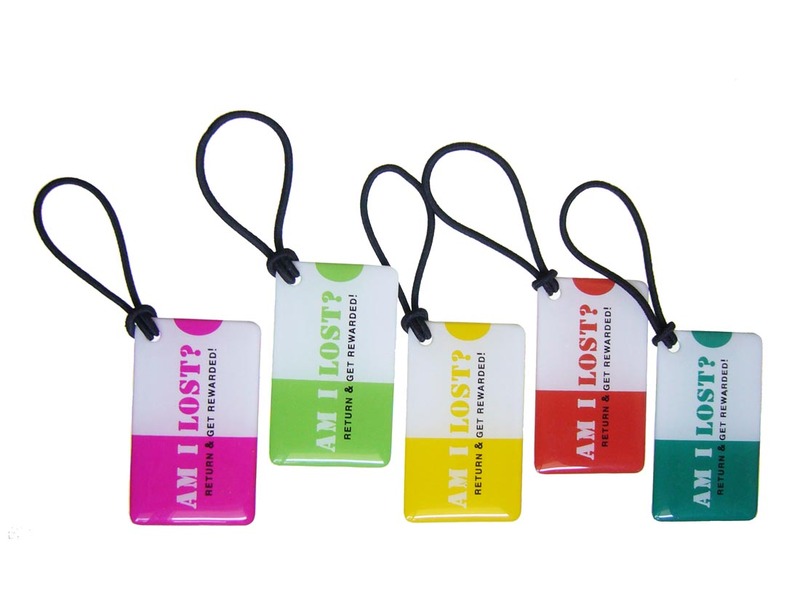 If your thing gets lost, this brightly colored tag will be very hard to ignore! They contain a NFC chip & easy to read instructions for the finder of your asset to contact you. AmILost vinyl stickers have just the right size to get noticed without affecting the asset's aesthetics, are waterproof, hard to tear or peel. They could be both indoors & outdoors on anything that is valuable to you. Stickers don't contain NFC chip. Card tags are lightweight, attractive & sturdy AmILost Tags. They are waterproof & can withstand any weather. The cards are laminated to withstand wear & tear. They come with a NFC chip. 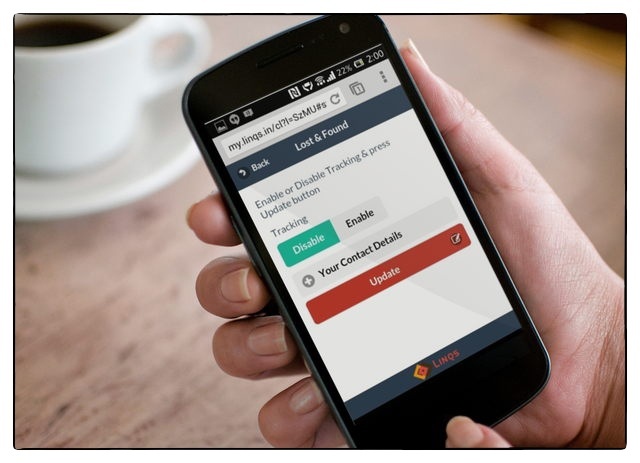 LINQS Asset Tracking Service that powers AmILost Tags is also available as Software-as-a-Service.